Webcam Decorah, Iowa: Vesterheim Norwegian American Museum - A webcam in Decorah, Iowa - camera location: Vesterheim Norwegian American Museum. Waterloo, Iowa: Cedar Valley Tech Works, 62.3 mi. Cedar Falls, Iowa: Cedar Falls Utilities, 62.8 mi. Dubuque, Iowa: Hotel Julien, 79.8 mi. East Dubuque, Illinois: Riverview Terrace, 80.4 mi. Ellendale, Minnesota: Weathercam, 91.2 mi. Coralville, Iowa: Iowa River Landing, 112.7 mi. Iowa City, Iowa: Iowa Old Capitol Building, 114.2 mi. Madison, Wisconsin: Constellation Building, 122.6 mi. 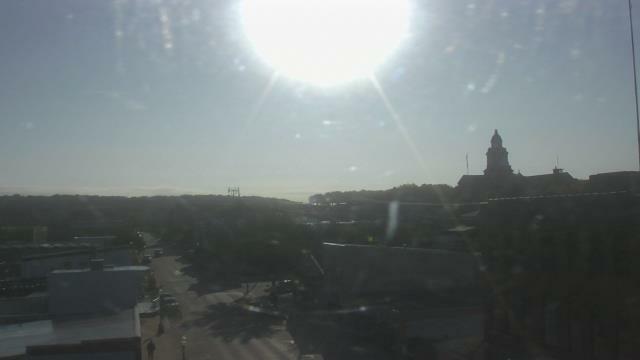 This webcam Decorah, Iowa with the theme City Views was added on July 7, 2015 and is operated by WeatherBug. It got 584 visitors since then. Shouldn't this webcam work or should the link be wrong please report that here. You can add this webcam here to myCams.